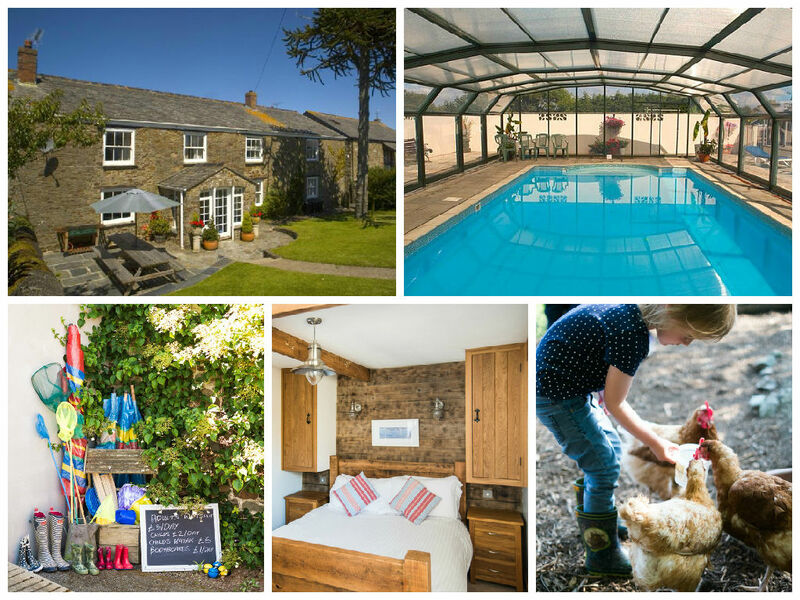 Court Farm is a child friendly complex of Cornish cottages, converted barns and stylish houses in the village of Marhamchurch near Bude. Facilities include an indoor heated pool, games room, tennis court and extensive outdoor entertainment for the children; and for mum and dad there are hot tubs, spa treatments, babysitting and a village pub on your doorstep. The Court Farm Holidays complex is located in the picturesque village of Marhamchurch, around two miles from the north Cornwall coast. A wide variety of family friendly activities including walking, horse riding, mountain biking, surfing, canoeing, sailing and much more can be found within easy reach, in addition to popular seaside towns and villages like nearby Bude. The Parent Friendly Stays team recently stayed at Court Farm Holidays – click the image below to read our in-depth holiday review! Court Farm is an attractive complex of self-catering holiday properties including six sympathetically converted farm buildings, four character-rich cottages and four newer, more modern houses. Most properties sleep between 4 and 7 people but there is also a larger property – the Farmhouse – which sleeps up to 12 plus cots. All the accommodation is spacious and well-equipped – including luxury gas BBQs – and the holiday complex has a wide range of facilities to entertain visitors. 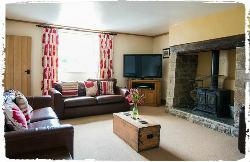 At Parent Friendly Stays we use the price of a week long holiday for four during the summer holidays as a good measure of prices, and at Court Farm you’ll find prices in the region of £1450 for a barn like Hayloft, £1465 for a Cornish cottage like Honeysuckle, or £2075 for a five-bed luxury house with hot tub like Chestnut. The owners of Court Farm describe it as “the perfect place for a child friendly holiday or family break” and having looked into the numerous facilities on offer, we can understand why! There’s a heated indoor pool with roman steps, which on warm days can become an outdoor pool as the entire roof enclosure slides back! The pool area also has changing facilities and a safe child pen. Outside you’ll find an all weather tennis court and a large and safe enclosed play area with climbing frames, swings, trampoline, trikes and pushalong toys, plus a wendy house and play shed with table football. Court Farm also has an indoor play barn with pool table for older children and a soft play area for toddlers. Children of all ages will also enjoy the opportunity to feed and pet a number of resident farm animals including goats, pigs, and an alpacca (plus spring lambs if you visit at the right time of year) and they can also help on the daily run to collect freshly laid eggs from the hens. Most of the cottages at Court Farm also come with their own toy boxes & a selection of children’s books. Putting all the child friendly features to one side, Court Farm is also very well equipped to keep parents happy too! All the complex’s properties are toddler friendly with built-in stair gates and all the other equipment you might need available on request including fireguards, wooden cots, bed guards, high chairs, booster seats – you can even hire baby monitors, pushchairs or baby backpacks if you like to save on space in the car! Court Farm is particularly well stocked with regards to other equipment you might need for entertainment purposes during your stay – there are mountain bikes and wetsuits available to hire for a small fee and there’s a small DVD library too – and for organised fun you can book swimming lessons to take place in the on-site pool. All of this means parents will never be short of ways to keep your little ones entertained! Many of the cottages come with their own private and enclosed gardens, perfect for safe play time on sunnier days. When it comes to unwinding at the end of a long day, there’s the option of a relaxing treatment for mum at the on-site spa, and dads will doubtless be pleased by the presence of the attractive village pub – the Bullers Arms – within a thirty second walk of the complex! 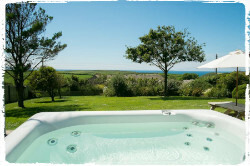 Some of the cottages have luxury hot tubs for a warm end-of-day soak! There’s a catering service available as an optional extra or you might wish to take advantage of the weekly Friday evening village visit from the local Fish and Chip van. 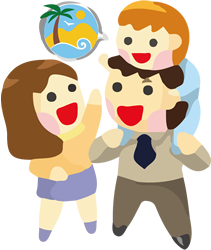 Or if you fancy a meal at one of nearby Bude’s many restaurants, Court Farm can provide an experienced babysitter. 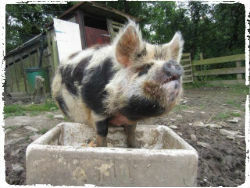 There’s free WiFi available throughout the site and pets are welcome in some of the properties. The owners of Court Farm seem to have thought of everything you’ll need for a family holiday – both for the children’s relaxation and for mum and dad’s too! Combined with a delightful rural location on the outskirts of the popular seaside resort of Bude, at Parent Friendly Stays we think this holiday is a guaranteed winner and one we can’t wait to visit ourselves. “At Court Farm we aim to provide a home from home experience with superb facilities and services to make your holiday extra special. If you’d like to find out more about family friendly holidays at Court Farm, including booking and availability enquiries, just fill out the form below.